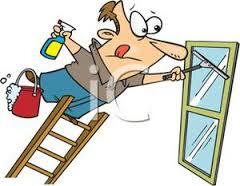 As it’s Holiday sesion you may be tempted to try doing some odd jobs around the house. But don’t try doing the dangerous one like your own window cleaning for a start it will properly look awlful and take all day,But most imported you may end up having a acsident be off work or even worse. Just pick up the phone and call clean and bright windows we can take care of your window cleaning at a price that won’t break the bank and most of all safely. Just site back after all your meant to be on Holiday are you not.